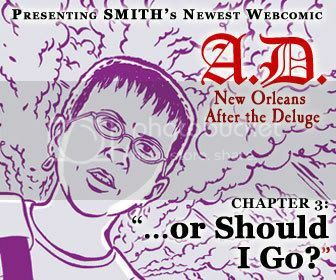 Chapter 3 of A.D., “…Or Should I Go?”, is now live on SMITH. Hamid sends his family off to Houston, Kevin fills the bathtub with water, and Denise seeks shelter — but finds only chaos. It is Sunday, August 28, the day before Katrina. Check it out now at smithmag.net/afterthedeluge.